In my previous article I gave you an overview of Azure Functions and discussed about the benefits of the Azure Functions. With this session I will cover you with necessary steps to create an initial basic functions app. 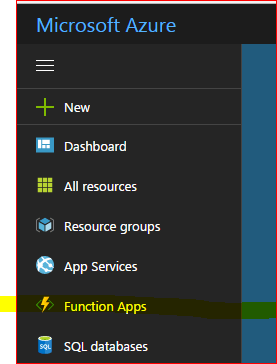 Login to Azure Portal, you will see Function Apps section in the left menu. This is where all your Function Apps will be listed, once you login. Select Function App from Web + Mobile category, and Click on Create Button. You will see deployment in progress message. Now since we have new instance ready. Let us create our first Function. 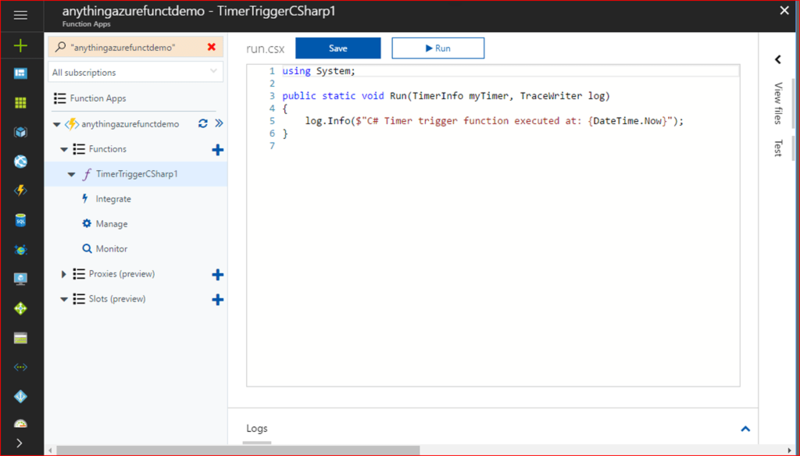 For the demo sake I am creating a Timer Scenario and selected CSharp as the language. Using the Functions –> Integrate section we can configure Input, Output parameters and Schedule Timers, to make it available as a WebAPI methods. You can call this functional logic from another application to invoke as a web API call by passing necessary inputs, to start another functional process. One example for this scenario would be to invoke a Database record archival call after completion of an order. This is will be applicable in case we choose the scenario WebHook + API during the creation of your functional logic. That’s all for now for this topic. I will cover more details about WebHook + API in next series. Please share your comments and rate this article to help me understand areas of improvement. 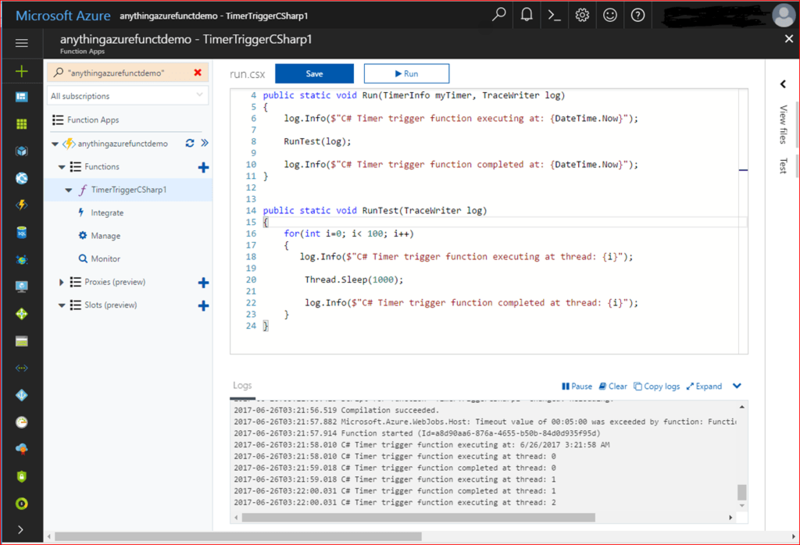 Azure Functions is a new cloud solution from Azure that would let you execute small pieces code or “functions” in the cloud. This means you do not have to worry about the infrastructure or environment to execute your little piece of code to solve any of your business problems. Functions can make development even more productive, and you can use your development language of choice. Pay only for the time your code runs and trust Azure to scale as needed. 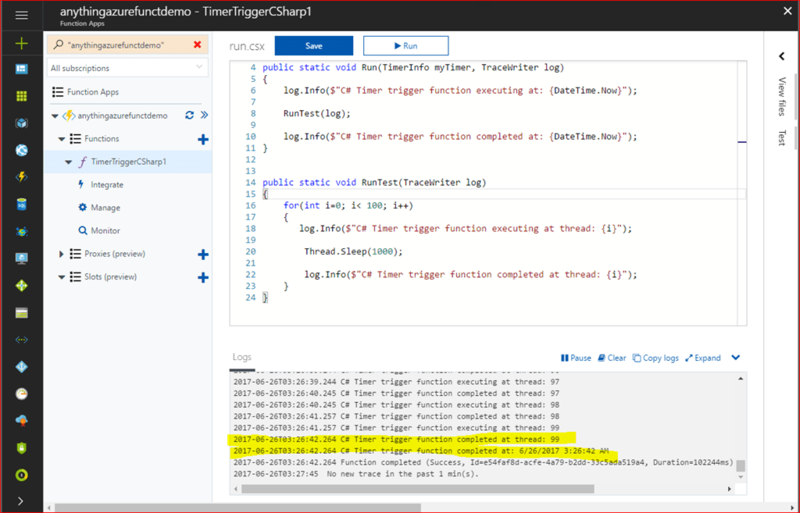 Azure Functions lets you develop serveries applications on Microsoft Azure. Supports wide variety of development language choices , such as C#, F#, Node.js, Python or PHP. Bring your own dependencies – you can bring any of your Nuget/NPM dependencies for your functional logic. 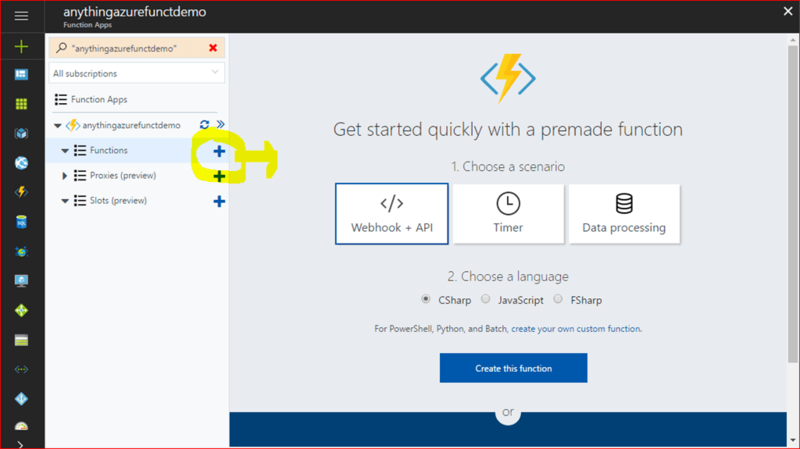 What can we do with Azure Functions? Azure Functions is a very good solution for processing data, integrating systems, working with the internet-of-things (IoT), and building simple APIs and micro services. BlobTrigger – Process Azure Storage blobs when they are added to containers. You might use this function for image resizing. EventHubTrigger – Respond to events delivered to an Azure Event Hub. Particularly useful in application instrumentation, user experience or workflow processing, and Internet of Things (IoT) scenarios. Generic Webhook – Process webhook HTTP requests from any service that supports webhooks. GitHub Webhook – Respond to events that occur in your GitHub repositories. HTTPTrigger – Trigger the execution of your code by using an HTTP request. QueueTrigger – Respond to messages as they arrive in an Azure Storage queue. 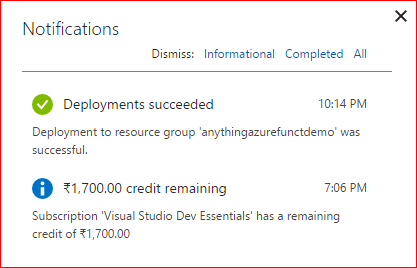 ServiceBusQueueTrigger – Connect your code to other Azure services or on-premises services by listening to message queues. 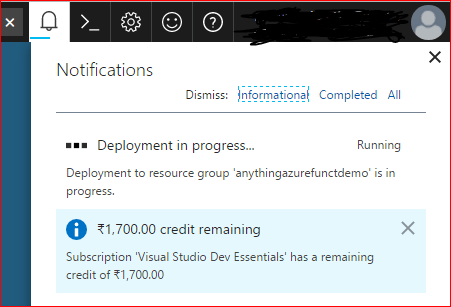 ServiceBusTopicTrigger – Connect your code to other Azure services or on-premises services by subscribing to topics. TimerTrigger – Execute cleanup or other batch tasks on a predefined schedule. Following are the services integration supported by Azure Functions app. App Service Plan – if you already have an Azure App Service running with Logic, Web, Mobile or Web Job, you can use the same environment for your Azure functions execution without needing to pay for extra resources. You will be charged based on regular app service rates. Consumption plan – with this plan you only need to pay for how long and how many times your functions runs and computational needs/resource usage during that execution time. Consumption plan pricing includes a monthly free grant of 1 million requests and 400,000 GB-s of resource consumption per month. Azure Functions developer reference docs. Earlier I introduced you the Microsoft Professional Program for Data Science. Right after few days Microsoft announced the BETA availability of two more tracks Big Data and Front End Development. This Microsoft program will help you to learn necessary skills from cloud storage and databases to Hadoop, Spark, and managed data services in Azure. Curriculum of this program involves learning how to build big data solutions for batch and real-time stream processing using Azure managed services and open source systems like Hadoop and Spark. Are you intend to pursue a Data Analytics career, this is the right program for you to gain necessary insights. So if you are a front end UI developer, this is something you can try out to enhance your skills. Each course runs for three months and starts at the beginning of a quarter. January—March, April—June, July—September, and October —December. The capstone runs for four weeks at the beginning of each quarter: January, April, July, October. For exact dates for the current course run, please refer to the course detail page on edX.org. Azure Cosmos DB is a multi-API, multi-model highly scalable NoSQL database services from Microsoft Azure platform. In order to develop an application consuming Azure Cosmos DB requires an azure live subscription or emulator in your local machine. The Azure Cosmos DB Emulator provides a local development/test environment for Azure Cosmos DB development purposes. Using Azure Cosmos DB Emulator, you can develop and test your application locally, without needing an azure subscription or without subscription costs. With this article I am going to take you through necessary steps and requirements to set up your local environment. 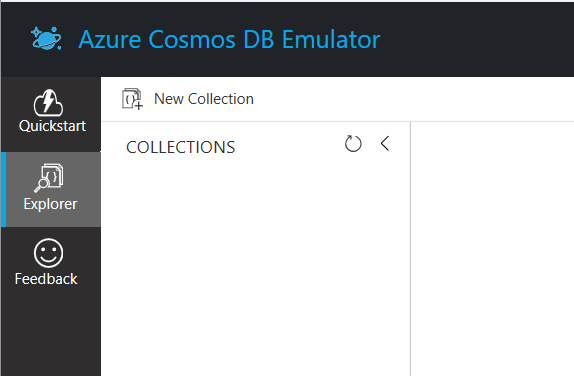 Download Azure Cosmos DB Emulator (DocumentDb.Install.msi) ** do not get confused by the name. Azure Cosmos DB is a super set of Document DB, and the DocumentDb emulator they tweaked a bit to support Cosmos Db. Additionally Azure CosmosDB emulator can be run on Docker for Windows. After installing Docker for Windows, you can pull the Emulator image from Docker Hub. After some time you can see the emulator started. When the Azure Cosmos DB emulator launches it will automatically open the Azure Cosmos DB Data Explorer in your browser. Incase you have closed browser and later would like to open the explorer again, you can open the Data Explorer by right clicking on the taskbar menu. Now you can write some sample app to try it, or download already created sample applications from Microsoft depending on the preferred platform of your choice. The following table is also helpful in determining when to use Cosmos DB Emulator and when direct cloud service. Depending on the choice of requirement, you would need to use associated services efficiently. Supports only a single fixed account and a well-known master key. Key regeneration is not possible. Supports multiple accounts and different master keys. You can regenerate keys any time from Azure Portal. Does not simulate multi-region replication Configurable as part of the platform, as needed basis. Does not support quota override feature Supports document size limit increases, increased partitioned collection storage etc. Might not support most recent changes to Cosmos Db platform Most recent platform update will be available. Hope this article was helpful for your initial start. If you would need to understand further on Azure Cosmos DB development follow the links. I will be writing further insights in later sessions.